Francis J. Castellino, Kleiderer-Pezold Professor of Biochemistry and director of the W.M. 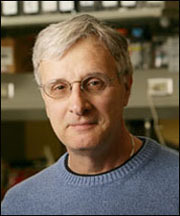 Keck Center for Transgene Research at the University of Notre Dame, is the recipient of the 2008 WYETH-ISFP Prize for outstanding contributions to the field of fibrinolysis, proteolysis and thrombosis. Castellino was chosen for the honor by an international jury composed of members selected from the advisory board of the International Society for Fibrinolysis and Proteolysis and previous WYETH-ISFP Prize winners. He will receive the $10,000 prize and deliver an honorary plenary lecture at the 19th International Congress on Fibrinolysis and Proteolysis this week (July 6-10) in Vienna, Austria. Castellino's research focuses on the mechanism by which the human body forms and dissolves blood clots. Among a number of important finds, he has established the mechanism of plasminogen activation, a key function of the body's formation of the enzyme that dissolves clots. Along with its scientific importance, his research bears directly on the treatment of heart disease, strokes and hemophilia. Castellino graduated from the University of Scranton in 1964 and received masters and doctoral degrees in science from the University of Iowa in 1966 and 1968, respectively. He completed two years of postdoctoral work at Duke University before joining the faculty at Notre Dame in 1970. He served as dean of the University's College of Science from 1979 to 2002. Castellino is an elected fellow of the American Association for the Advancement of Science and of the New York Academy of Sciences. He has served as a member of the editorial boards of the Journal of Biological Chemistry and Biotechnology and Applied Chemistry and is a former member of the Biomedical Sciences and Hematology Study Sections of the National Institutes of Health (NIH). Castellino also has been the recipient of an NIH Research Career Development Award and a Camille and Henry Dreyfus Teacher-Scholar Grant. He was awarded honorary doctorates from the University of Scranton in 1984 and the University of Waterloo, Canada, in 1994. Originally published by William G. Gilroy at news.nd.edu on July 06, 2008.